In July of 2007, I decided it was time to re-roof my home. I had been interested in experimenting with solar heating for some time. There is large section of south facing roof on my house over top of an uninsulated attic crawlspace. I wanted to make use of this surface in some way for a solar heating project. I thought about what I might do for a long time. Most rooftop solar heating installations involve mounting flat panel collectors to the outside surface of a finished roof. 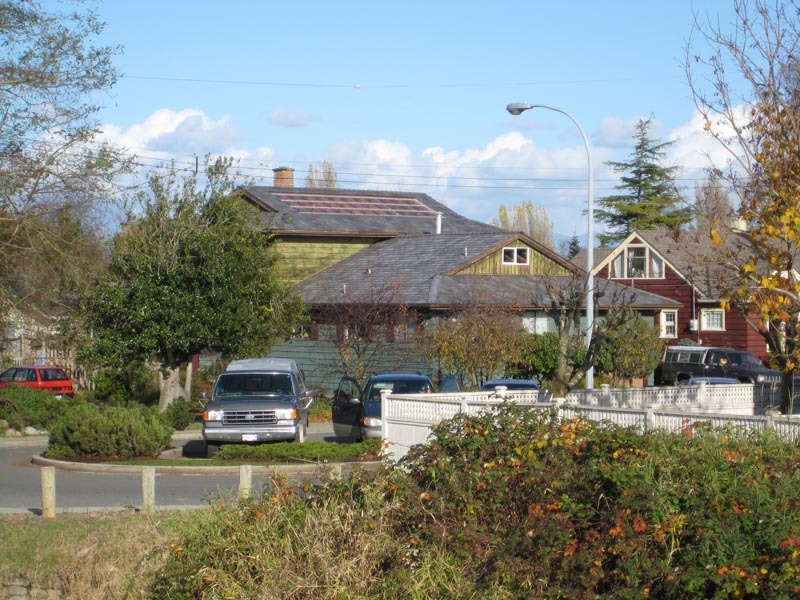 I thought since I was going to put on a new roof anyway, I would build my solar installation directly into the roof, offsetting some of the roofing costs. 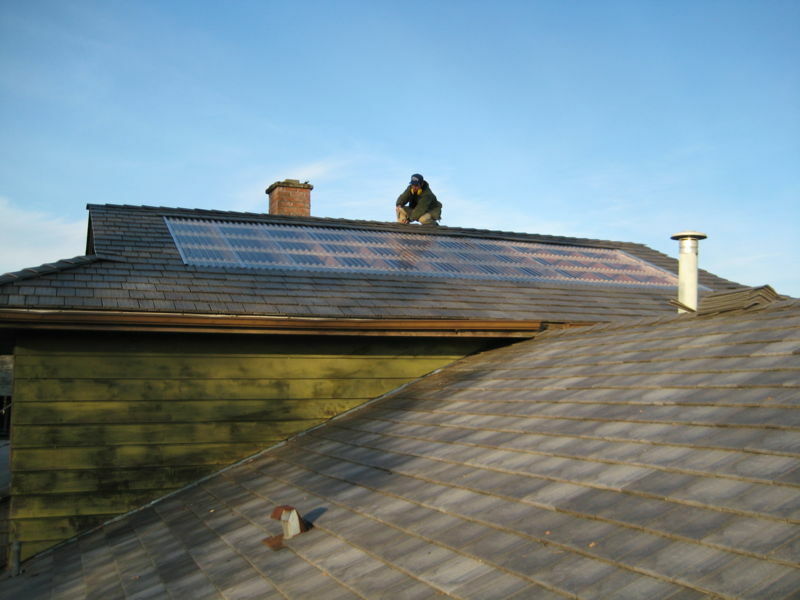 Being a tinkerer at heart, I did not want to commit the entire space to any one type of solar heating solution. 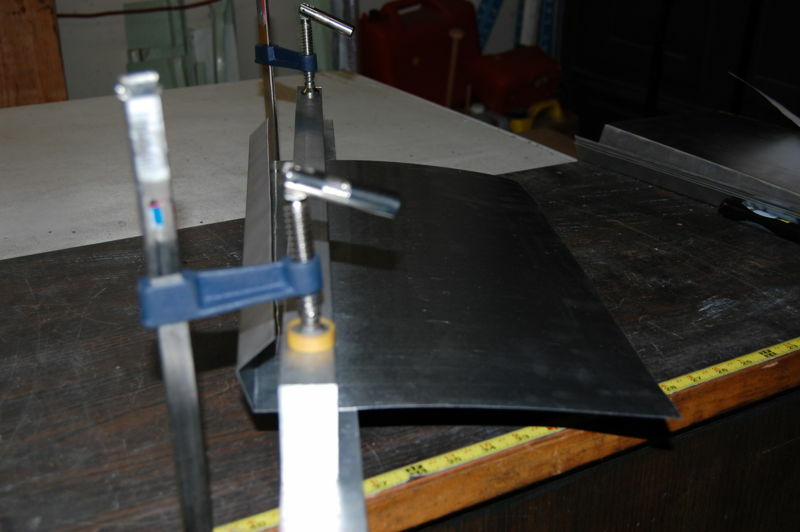 I wanted to be able to experiment with different solar collectors. The ideal solution, I figured, was to create a transparent roof. Then I could experiment with whatever type of collector I could dream up simply by mounting it under the roofing, between rafters. Skylights are commonplace, but I was thinking about something on the order of 8ft x 20ft (a little bigger than your average skylight). 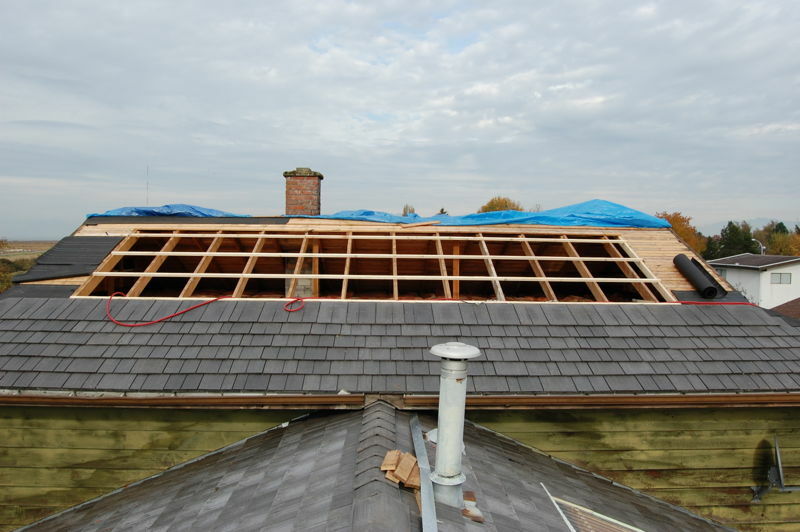 As it turned out, this was fairly easy to do for no more cost that that of the roofing material it offset. The key was that the space below the roof was not living space. It was not insulated, and it was already vented directly to the outside. Thus, the transparent roofing installation didn’t need to be air tight or offer significant insulation for the space underneath. It just needed to shed rain. There is a product called Suntuf which is a corrugated transparent polycarbonate roofing panel often used for greenhouses. I selected this product for my roof. There are cheaper transparent PVC panels that are commonly used in do-it-yourself projects, but PVC has too low a softening temperature and tends to fade with time. PVC also tends to shatter when impacted. Polycarbonate panels don’t have these drawbacks and are worth the additional expense. Would it last? I was hoping to get at least 10-15 years out of it. The rest of my new roof has a 50 year warranty. Given that I didn’t expect the polycarbonate material to last nearly that long, I made sure the panels could be easily removed and replaced without disturbing the surrounding roof. Would it warp or fade? I had seen a few backyard greenhouse installations using transparent PVC that looked horrible (warped, faded, and mildewy) after a few years. Polycarbonate has a much higher softening temperature so I was hoping it would not suffer from warping, and I had read that it would not fade. We’ll see about the mildew/mold problem, but even if I have to go up and clean the panels once a year it’s not that big a deal. Would it stand up to the snow load? Actually, I was not too concerned about this. In the past 10 years I haven’t seen more than 6″ of snow. The roof was designed for the appropriate snow load for our region, but it still seems a bit flimsy? Would it stand up to the wind? I was more worried about this. We get some fairly severe winter storms here. Time will tell. Would it leak around screw heads? The installation instructions called for drilling oversized screw holes to allow for thermal expansion of the panels. The result was that the rubber washers on the screws barely covered the holes. I was a little worried that with thermal expansion and contraction of the panel, leaks might develop. Normally these types of panels are used for greenhouses and small leaks probably aren’t that big a deal. I decided to accept the risks, confident that I’d be able to find solutions to any problems that arose. Not only that, but I decided to build two transparent sections of roof, the other being in an east facing roof over my attached garage. This roof has a large enough space underneath it that people can walk around reasonably comfortably. I thought the space was ideal for an indoor greenhouse and sunspace. I also thought it was a good way to test out construction methods since the outside of this roof is barely visible from the ground unlike the south facing attic roof which is very visible. Update Jan, 2009: Most of my concerns have been laid to rest. We had more snow this winter than I’ve seen in the last 30 years (a little over 2 feet at it’s peak) and the polycarbonate roofing held up just fine. We’ve also had some severe wind storms that have had no noticeable effect on the roof. As for leaks, some of the screw holes (about 1 in 50) did leak, but on closer inspection it was the result of burrs left over from the drilling process. After deburring the leaking screw holes, the rubber washers sealed properly and I haven’t had any problems since. I hired my friend, Steve, to do the re-roofing of my home. The main roofing material you’ll see in the following photos is a product called Enviroshake which is made from recycled tires. Re-roofing took several months of part time work. The installation of the polycarbonate panels was the interesting part so that is what is shown in the photos below. The finished east facing roof over the garage. This section was done first because it’s barely visible from the ground. A closeup of the flashing used for the east roof. This flashing was made by cutting up sections of an old steel garden shed. A mock up showing how the flashing fits with the shingles on the east roof. Underneath the east roof. This is where the indoor greenhouse will eventually be located. It’s amazing how much more cozy and inviting the space feels already. For the south roof, I decided to try my hand at making custom flashing. 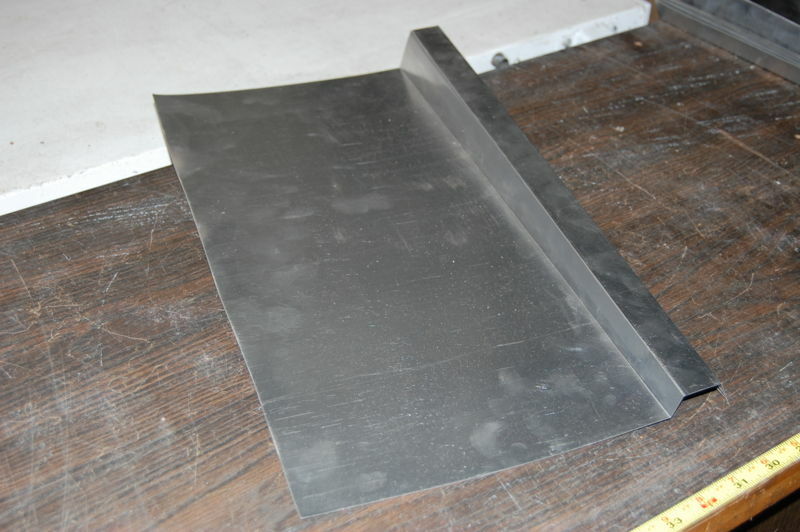 This is the roll of aluminum flashing I started with. 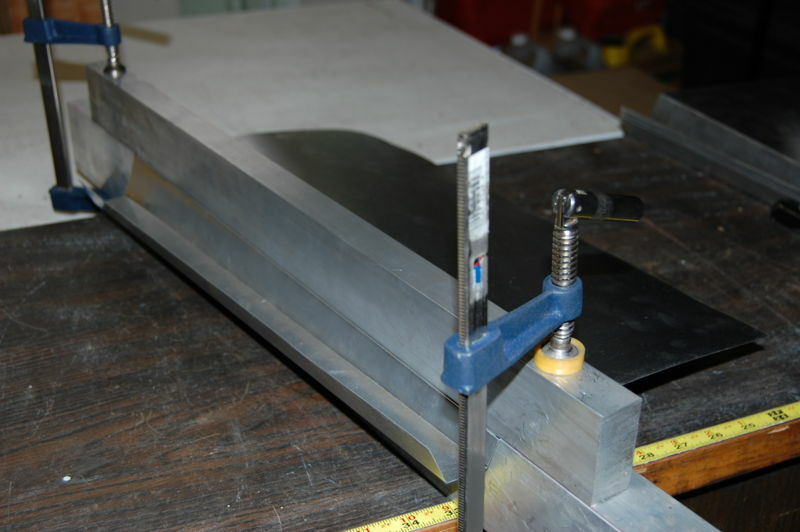 I cut pieces off the roll and bent them between an improvised sheet metal brake made from two pieces of aluminum bar clamped together. Bending the front. This material is light enough that it can be bent by hand. The improvised brake is required only to give a nice straight bend line. 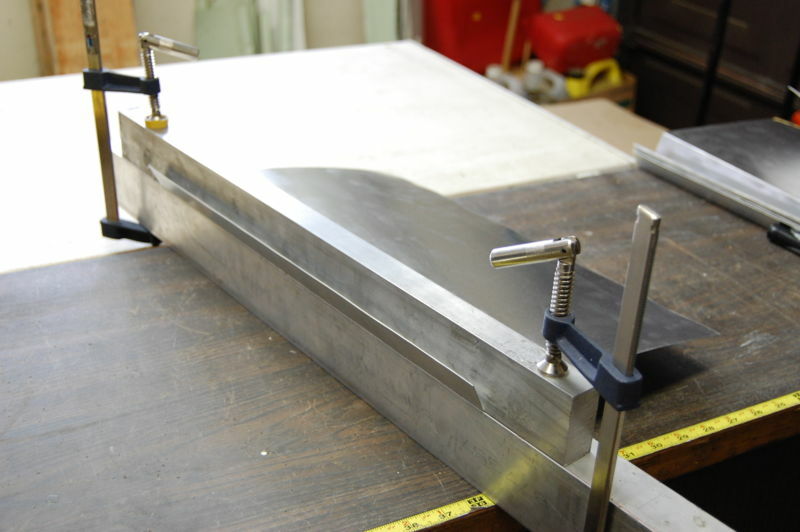 Flashing clamped in preparation for the final bend. Viola! Finished custom flashing. Note that not all bend lines are parallel. 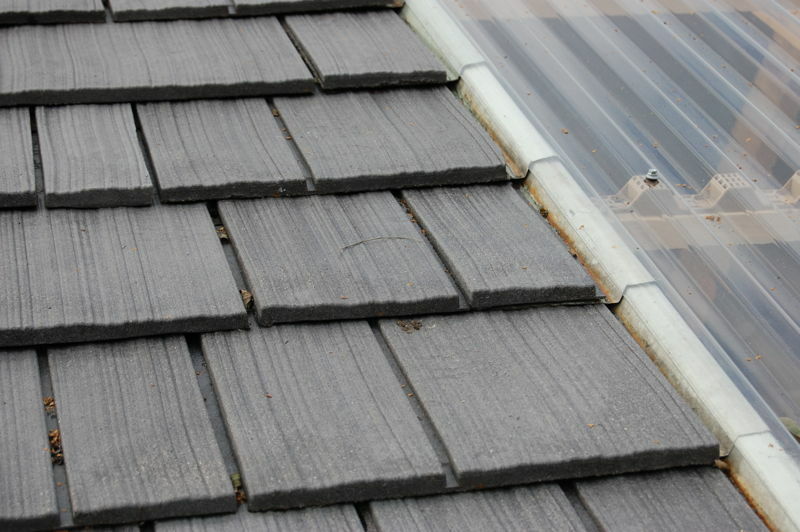 The “hump” is smaller at one end to account for the thickness of the shingle. Construction progressing on the south roof, looking north. Closeup of construction on the south roof, looking west. Closeup of construction on the south roof, looking east. 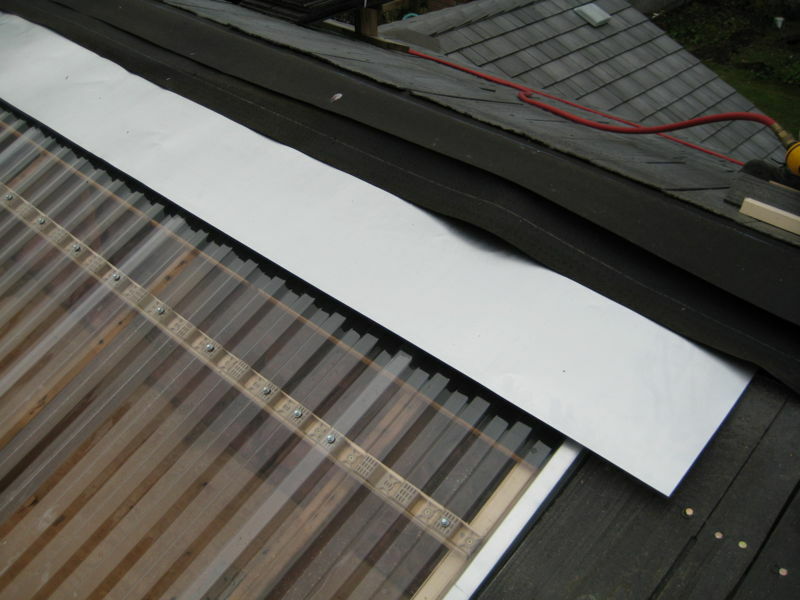 A continuous sheet of flashing covers the top of the polycarbonate panels. We were careful not to cover any screw heads so the panels can be easily replaced if necessary. A view of the flashing at the top of the panels prior to installing the final rows of shingles. Steve driving the last spike. A view of the completed south roof with 23ft x 8ft of polycarbonate panels. A view from inside the attic crawlspace. I added 3 sheets of plywood for a makeshift floor while the roof was open. A view of the house looking northeast after completing the roofing project. In February of 2008, before experimenting with any solar thermal collectors, I decided to measure the temperature in my solar attic. I measured at 3 hour intervals over a 24 hour period using a digital weather station with logging capabilities. I measured once on a cloudy day and once on a sunny day for comparison. The following plots show the results. Impressive though this data may seem (about 40°C peak with outside temperature around 10°C), it’s not particularly useful. It only indicates the maximum stasis temperature of the attic (with no solar thermal collectors in place and no heat being extracted into my home). It gives little indication of how much useful energy I may expect to extract. So what good is it? Well… it was easy to measure and rewarding to see. Sometimes you need a little boost to the morale when tackling large projects like this. Renovate space under east facing roof for an indoor greenhouse. Renovate space under south facing roof for easy access to install flat panel collectors. I need to install a plywood subfloor so I don’t need to walk on the rafters. Before doing that, I want to pull up all the insulation and check that the building envelope is well sealed everywhere. I’m also considering installing additional insulation (currently there is only 6″ or about R19 which is well below the recommendation of R49 for my region). 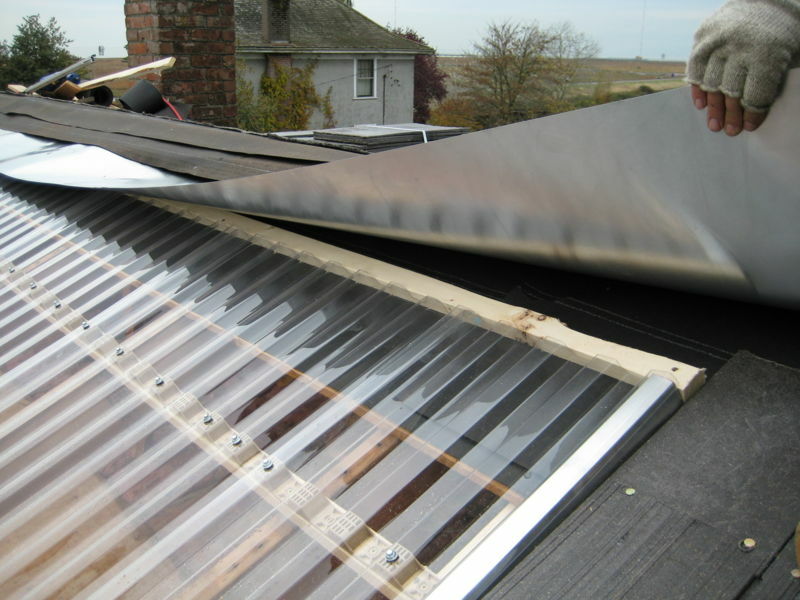 Build and install solar collectors under south facing roof. 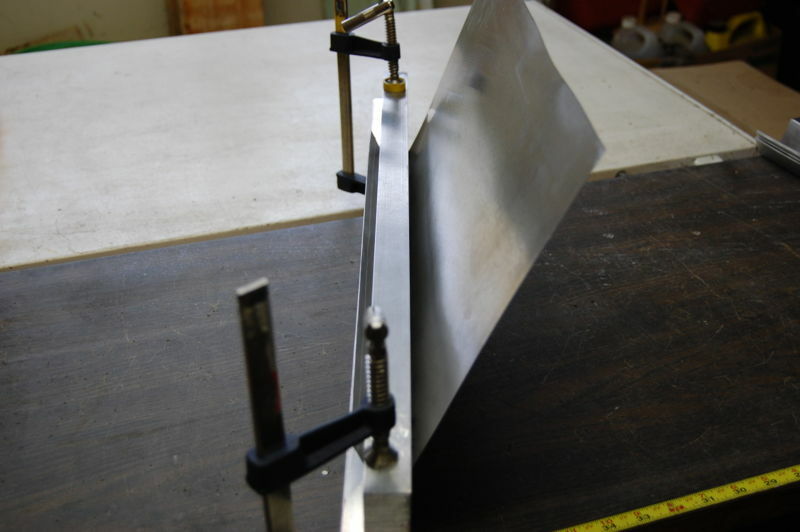 I’ve already experimented with building a flat panel solar collector for water heating. 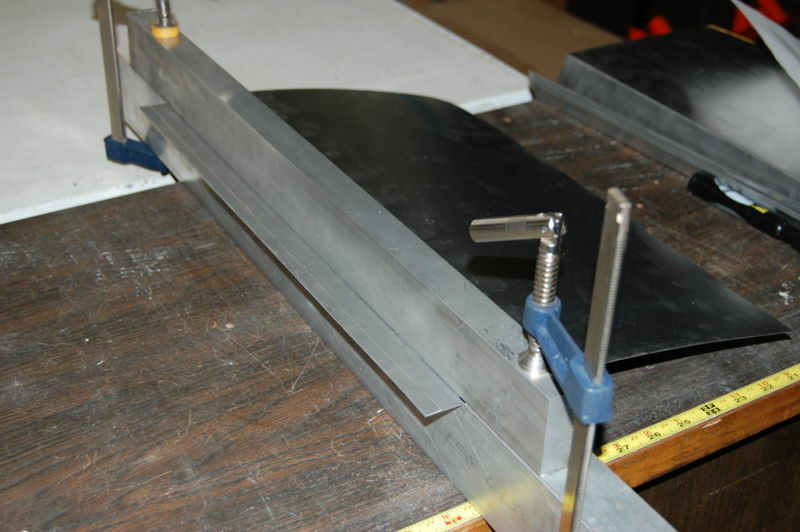 See the results from that experiment here: How to build a simple solar water heater. However, I don’t trust that design for permanent installation since it is too prone to leaks. Further experimentation is warranted. The polycarbonate roofing has held up great. Over the past 7 years the panels have been exposed to 70 km/h winds, 2ft of snow, and temperatures ranging from -20 to +55 degrees C (inside the attic). There has been no mold or mildew. The panels are as clear as when first installed and have required no maintenance. One commenter has suggested that I can expect a lifetime of over 20 years. The one issue I have experienced is leaks at screw heads. I do an inspection at least once a year during a heavy rainstorm and I usually find 2-3 screw heads that are dripping water into the attic. I think things can shift around a lot due to thermal expansion and contraction of the panels. I have been contemplating more definite solutions to this problem (if you know of any please leave a comment), but so far it hasn’t been so bad to just adjust the couple screws that start dripping each year until they stop dripping. My priorities have shifted over the past 7 years and I have yet to install any type of mechanism for transferring heat from the solar attic to the home below. However, I have experimented with simply installing a fan in the attic access hatch and blowing attic air down into the home when the attic is warmer that the house. This does a good job of overheating the top floor of my house while leaving the bottom floor cold. This was no surprise but was worth the experiment. A true solution should be a closed system (not drawing outside air into the home) and should circulate heat down to the 1st floor. Unfortunately there isn’t a convenient place to run an air duct to move hot air all the way down to the first floor, so my solution (if I ever get around to it) will likely use water to circulate the heat. One unexpected benefit of the solar attic is passive cooling of my house in the summer. Let me explain how that works. Because I was worried about the attic overheating in the summer, I installed two awning windows at opposite ends of the attic. I can open these windows in the summer to provide additional ventilation and close them in the winter to capture more heat. The first summer, when I opened the ventilation windows and returned to the attic access hatch to descend from the attic, I was struck by the strong draft rising through the hatch from the house below. I immediately recognized that what I was experiencing was a solar chimney effect. That is, the heated air in the attic was rising and exiting through the open ventilation windows. This in turn was drawing air through the access hatch from the house below. This in turn was drawing cooler outside air into the house through open windows. It’s like having a whole house fan but with no fan. The system is powered passively by solar energy. I will admit it is only anecdotal evidence but summers certainly do feel cooler in the house now compared to before installing the solar attic. However, it’s possible I could have achieved much the same benefit without the solar attic simply by adding extra attic ventilation and opening the access hatch in the summer. In theory I can improve the cooling capability of the current setup by adding some thermal mass (ex water barrels) in the attic. Then the thermal pump will operate 24/7, drawing cooler night air into the house, even when the sun isn’t shining. Note that we do not use air conditioning or the above strategy would not work. 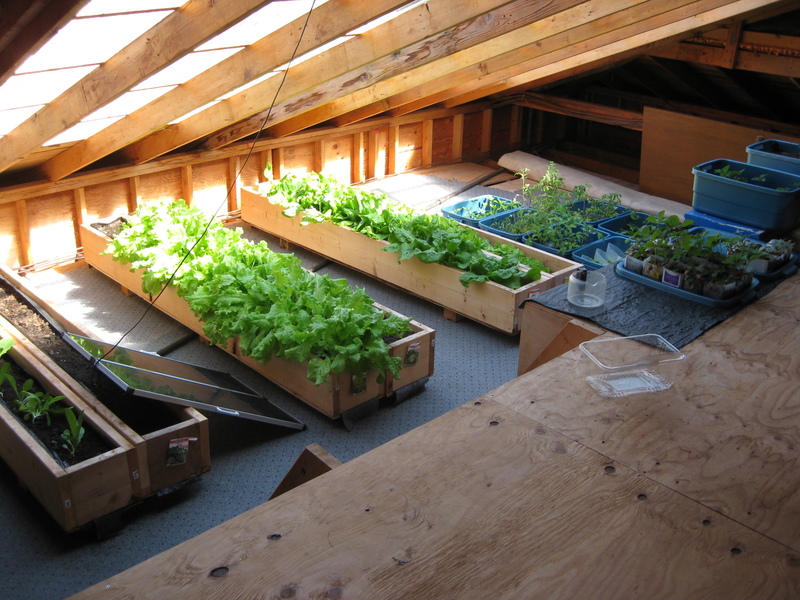 In my lower attic (above the garage) I’ve experimented with growing lettuce, tomatoes and peppers. Lettuce does well in the early spring, and late fall when it’s too cold to grow outdoors, but does not do well in the heat of the summer. Tomatoes and peppers like the heat, unless it gets really hot. I installed a solar powered exhaust fan under one of the existing attic vents to lower the temperature a bit. This helped a lot. 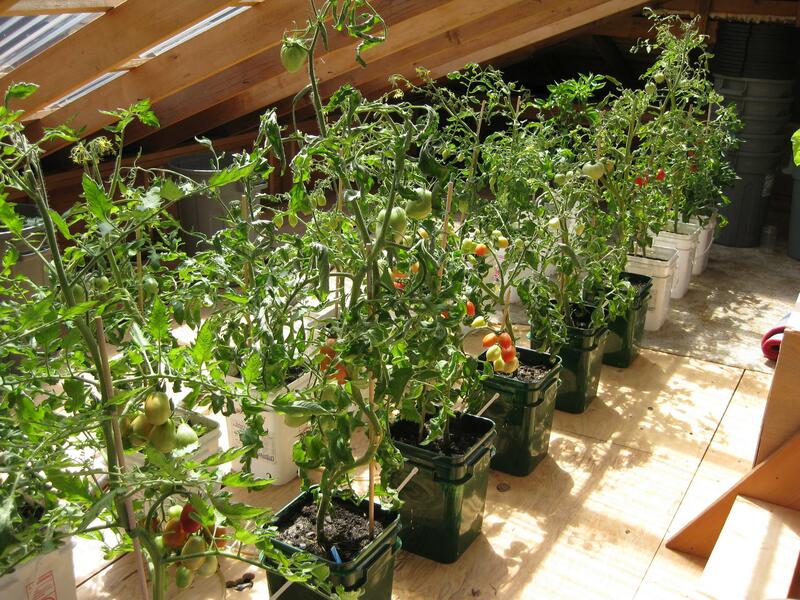 Growing tomatoes in the solar attic in July 2009. Even though tomatoes and peppers like the heat, it takes a lot of effort to keep them well watered. These days I don’t grow anything in the attic through the summer. I just use it for early lettuce and starting seedlings before transplanting outdoors. 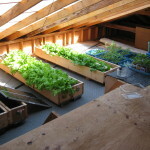 Growing lettuce and seedlings in the solar attic in May 2012. Note the solar panel in the above image. It is directly wired to a 12V exhaust fan under one of the attic vents. Even in May it can get a little too hot for lettuce without the fan. I like the idea of your heat trap. Is yor plan to vent the captured heat to the home using fans? Are the cold nights going to draw heat from inside the home? Keep up the good thoughts all these ideas are an inspiration and an on going process. The great thing about the roof is I can experiment with lots of solar collection methods underneath without committing to anything up front. So my plans may change, but my current one is to install solar water heating panels (either commercial or home made) under the transparent roofing. The water will be circulated by pump to an insulated storage tank inside the house. From there it can be circulated through radiant heating tubes under the main floor (accessible quite easily by crawlspace in my home). Cold nights should not draw significantly more heat from the house than before since the attic space was already outside the building envelope and it was already vented. 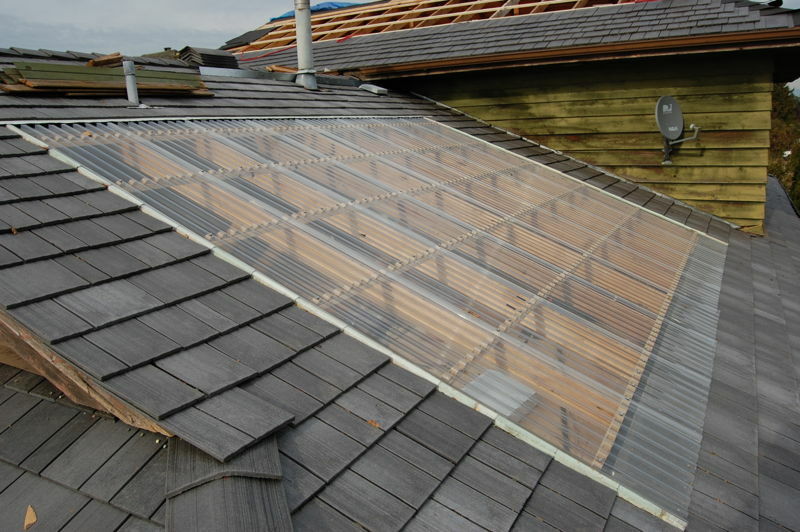 In the summer, if I have too much heat (likely), I will do one of: a. vent it through additional windows I’ve installed in the eves for this purpose, b. install silvered mylar under the roof to reflect the light, or c. use the additional heat to heat a hot tub. Neat way to collect and store the summer heat. I had a corrugated iron roof that I had let a few polycarb sheets into also. The iron was a great heat-trap too, as I deliberately painted the sun-ward side matt black and the cold side clean white. I then put some flat sheets of slightly opaque fiberglass in the ceilings of hallways, the shower, and over the kitchen. This increased the light within the house greatly. To maintain some ceiling insulation over the fiberglass sheets you could fit a layer of clear flat 2mm polycarb on top of the ceiling joists. I then hung an old flow-thru Electrolux vacuum cleaner hug in the apex of the roof. I fitted a ceiling fan thermostat (which turns on when it gets hot) to a couple of plugs in the roof space, then mounted a switch on the wall in the hall so I could turn it on and off to over-ride the thermostat. I then ran the hose from the cleaner (from the ‘blow’ side) down into the coldest room in the house. It worked perfectly pulling a steady flow of 30 to 40 degree Celsius air into the house. It cost very little to run, and the power used simply ended up as heat added to the air flow. Went for ever and made a real difference. I turned it on when I saw roof space temperatures get more than 10 degrees above the in-house temperature at some stage of the day, and it was on virtually all year working all by itself. You obviously have some ‘instrumentation’ – I used those little electronic greenhouse thermometers which have an inside sensor and an outside sensor on a lead. One on the inlet and one on the outlet in the room. Worked a treat, and very cheap heat. …and of course the ‘nice’ thing would be a solar panel to run the blower eh. One sep at a time! And be careful with that wiring! Really enjoy your site — some very creative ideas. 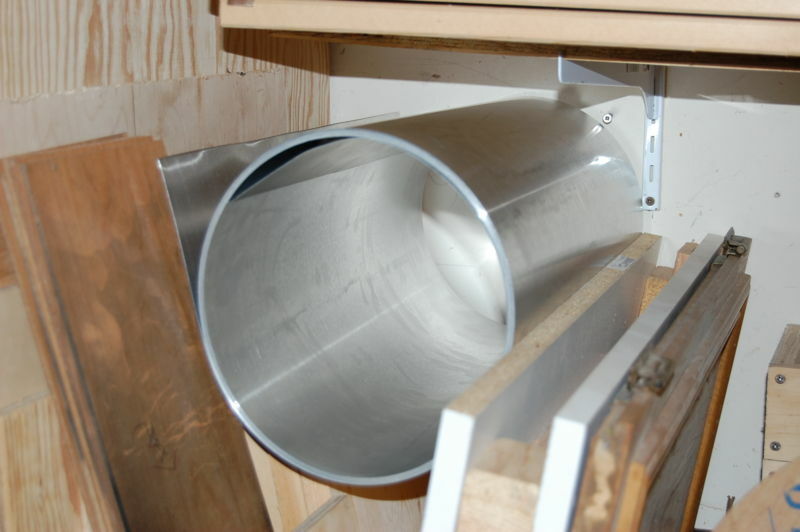 This is just a thought, but I wonder if it would be a good idea to first experiment with your Solar Attic as an air heating collector? The advantage would be that it could be very simple — little more that some enclosure and a couple ducts and a blower. Of course, it does not give you any storage capability, but for a lot of homes, the house thermal mass is enough to provide storage for a fairly good sized collector. I guess this is a bit selfish on my part, but I would really like to see how it performs as an air collector, and how happy you are with the distribution of heat and whether is has any tendency to overheat the house or not. Your site, http://www.builditsolar.com is great too. I’ve been a follower since I first read your solar barn article in Home Power Magazine several years ago. I did some experiments with the solar attic as an air heating collector. I did the simplest possible experiment and installed a blower in the access hatchway, just blowing air down to the floor below. It worked well at overheating the top floor of my house… as expected. This was an open system, drawing outside air into the attic, heating it and blowing it down into the top floor… not very efficient, but probably better than using the same power directly for space heating. Unfortunately there isn’t a convenient place to run a proper duct to move the hot air all the way down to the first floor. When experimenting with water heating solar collectors in the attic, I saw apparent efficiencies on the order of 150 to 200% (ie the amount of heat absorbed by the collector was 1.5 to 2 times the amount of solar energy that actually hit the panel). In other words, the collector was functioning more like a heat exchanger than a solar collector. That being the case, I might experiment with some simpler designs, focusing only on moving heat from the attic rather than absorbing sunlight (the solar attic already does a pretty good job of that). Love the set up with the vacuum cleaner. Where is this roof that gives 30-40 degree heat and can you give an idea of the size of it. Just working on a project in the UK and this sort of simple solution would be great although the heat available would be far less. Really interesting about the solar hot water too. I painted my roof black, covered it with toughened glass from the recycle shop, then fan the hot air from under the iron down in to the house. I have seen 84 deg Celsius coming in. It heats air to 30 -35 deg in the rain. Hot air flows through a car air conditioner condenser to pre-heat water. (this water then travels through a parabolic trough reflector to heat it to 80 deg C) It is all automatic with thermostats. A small motor and gearbox close the vent when the fan is not running. This thing collects some serious heat in our cold southern climate. We heat the house to 30 deg C nearly every day. The house stays warm all night with heat stored in furniture, walls, books, everything in the house is warm. The fan blows 800 cubic feet of hot air into the house every hour. The house is always 20 deg C in the mornings, even though outside temps drop below 5 deg C. I have sealed all the air leaks and double glazed the all windows. I have about 30 square meters of collection area. A better looking but more expensive alternative would be to use your “Suntuf” (we have “Laserlite” here in Australia) spaced 5 mm or so above an iron roof with a rubber washer. I have two hot water cylinders inside which “leak” their heat into the house. My goal is to eliminate the use of firewood. This has been a very worthwhile project. Would love an update on your attic solar collector. Needing to reroof a 1930s home with half of the house roof with southern exposure. The solar attic is doing great. A few drips around some screw heads at first (maybe 1 out of every 20), but they were relatively easy to fix (just removed the screw, deburred the hole with some sandpaper and replaced the screw). In the past 2 years, the polycarbonate panels have stood up to 50 km/h winds, 2ft of snow, and temperatures ranging from -20 to +55 degrees C (inside the attic) without any problems. No mold or mildew either. They are as clear as when first installed without any maintenance. I’m still experimenting with solar collectors in the upper attic. Actually I’ve decided the attic IS a solar collector and what I really need is just a heat exchanger to move the heat down to the main floor where I’m installing radiant floor heating. 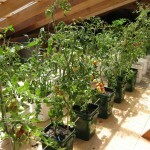 In the lower attic I’ve installed a “grow op”: nine 8ft long rows of tomatoes and peppers. They sure love the heat. I can plant them in my solar attic almost two months earlier than I can outside and I don’t have any problems with weeds or pests. I collect rainwater off the same roof to water the plants. A client has just given me a kitchen extension brief which includes an active (fans) solar roof and Trombe wall combined (the Trombe wall is higher). You illustrate how simple stuff can be. Always a good idea to cautious with roofs and heat. Stuff can get very very dry with obvious risk especially with curved surfaces and water pools as lenses (seen it). If anyone is interested in non invasive methods I have Hundreds of high contribution ideas that pay back quickly. I’m a single female. I’m very interested in using the collected heat in the attic. As I live in Arizona, and attic heat is vastly available. Could some one get me a plan to bring it from the attic into the house. Would an exhaust fan work,installed to flow from the attic to the inside,in possible 3 palces in the home? I have a 1450 Sq foot home. Also interested in using the attic heat for heating hot water. I have a 4×8 pop can solar collector outside my garage that has a blower with a attic fan sensor to turn on and off the fan. I also put a bathroom exaust fan in my garage attic to blow the warm air down into the garage when it also warms an attic fan sensor. Both sensors are adjustable to what temp. they kick on and off. When it is about 30 f outside and it is sunny the garage warms up to about 50 f, With the wall insulation the garage is about 40 f in the morning. The garage has an eight a foot ceiling that is covered with osb and insulated, it is also 22’x40′. In southern Wisconsin. Great idea. I plan on doing something similar on my garage renovation this summer. It might help to have an additional layer of glazing, say a thin sheet of plastic sealed to the backside of the rafters. It would have to be baffled or have flow channels, but I imagine you could achieve additional heat gain from this insulated layer, as well as stop night-time convective losses back out of the glazing. As opposed to using corrugated polycarbonate, I want to use 4mm twinwall in two layers (4″ apart). Great concept, I was wondering what pitch of roof you have. Go for it! And thanks for insrumenting and measuring performance of your handy work. My own plans for a similar integrated roof collector are still just plans but I will have a purpose-built 2:1pitch due south facing and with 4 foot rafter spacings. I have some 20year old installations of that polycarbonate roof and nothing but praise for the material. Hi Wayne, I believe the roof pitch is 5/12. It certainly isn’t ideal for capturing winter sun, but you work with what you have. Good luck with your project. I’ve experimented with a few simple collector designs but haven’t installed anything permanent under the roof yet. Other projects have taken priority. The polycarbonate seems just fine after 3 years. I hope you are right about the >20 year life span. Looks like this could work if you pump the hot air that collects in your attic into your house on a sunny cold day. I just discovered your website…. and am glad that there is some coverage for solar air heated systens….. I wish I had seen this site two years back…. Anyways…..
Jersey providing about 375 sft solar aperature at this 2000sft home. I installed a small 1500cfm blower in the center near the top of this greenhouse that would blow the hot air down below the concrete floor. Below this floor was a 3ft deep insulated rock storage consisting of 4″-6″ rocks through which the hot air was recirculated and then returned to the greenhouse for further heating. This enabled transfer of solar heated air from the hot greenhouse to the thermal storage below. 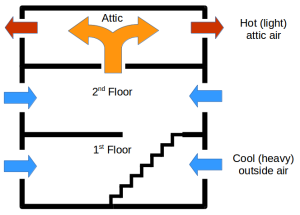 The thermal storage was connected to intake air from the basement and was connected to the return air near the heating furnace. During the heating season….the normal return air would be blocked (by a damper) and the air in the basement would be sucked through the warm rocks into the furnace and distrubuted to the house in the normal manner….. if the temperature fell further….. the damper would open and the retrn air would be restored and the furnace would kick in….. Over the three years I lived there I have saved as much as 60% on heating costs….. I spent about $11,000 and got a $4000 Tax Credit…. during Jimmy Carter’s term as President. I do not know what happened later as I sold the house and moved away. This site is fully powered by 6x230W PV Panels with (4×12V, 150Ahr) batteries with a (oversized) 3000VA Inverter to ensure mininal voltage dips during starting of 0.5hp solar hot air blower or water pump. To ensure availability of water year round…. a 125,000 liter (30,000 gallon) open storage tank (like a swimming pool) uses water harvesting from the 0.6 acre site for ALL domestic and estate needs… yes I will be treating the sewage to grey water for use in the garden, estate, etc…. I HAVE NO ELECTRICITY FROM THE GRID OR WATER FROM ANY UTILITY OR EXTERNAL SOURCE…. The project should be operational by end 2013…. 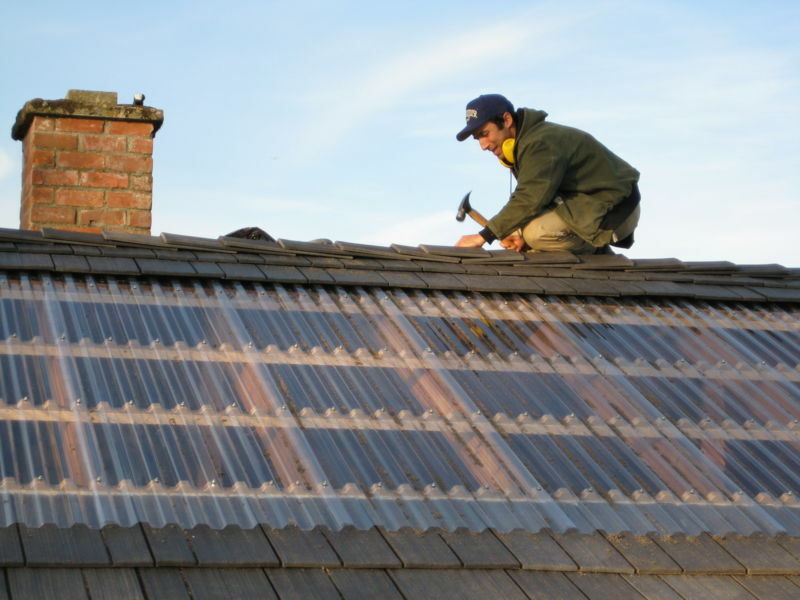 Hi Rob – not sure if you will check this – I’m interested in the polycarbonate roofing and am wondering how noisy your roof is during heavy rain events. Any new advice/comments regarding the roof material in general since you last updated this post? There is at least 6″ of insulation between the attic spaces and living spaces in my home. That’s a pretty good sound barrier. It’s noisy if you go into the attic during a rain event, but I rarely do that. Nothing new to mention about the performance. The roof is holding up fine and stil looks like the day it was installed. I’ve stopped worrying about it. Ran across your page through Gary @ BuildItSolar…great website. I just want to thank you for all the great information you have put up here…truly interesting. And I’m glad to see that your roof is working the way it should. Hopefully I will be able to put this information to good use in my forthcoming new small home project up in the wilds of British Columbia! I found your site very helpful Rob. Thanks for putting it up. I am building a 20×24 ft storey and a half garage with a 45 degree roof with one slope squarely facing south. I hope to follow your experience with the Polycarbonate sheets on at least half of that slope. After making a three, 4’x8′ panel domestic hot water system using Gary Reysa’s design as starting point (www.builditsolar.com) I am a believer in the benefits of double glazing when the temperature differences between inside and outside are high like 40 deg C or 104 deg F (or more) which is not untypical for my type of system. I used twinwall polycarbonate sheets which were quite expensive. However for this attic situation and, as one of your previous readers commented, just add a sheet of plastic across the rafters underneath the corrugated sheets to give you the double glazing effect and, I would add, seal the ends between the corrugated sheet and the plastic sheet with some polyiso insulation. What kind of plastic sheet to use? Tedlar has been suggested and was used in a commercial Hot water collector I saw. This may be cheaper than the twinwall polycarbonate and with the larger air gap may provide more insulation value. Has anybody tried Tedlar or a related product called Kynar for the second layer? 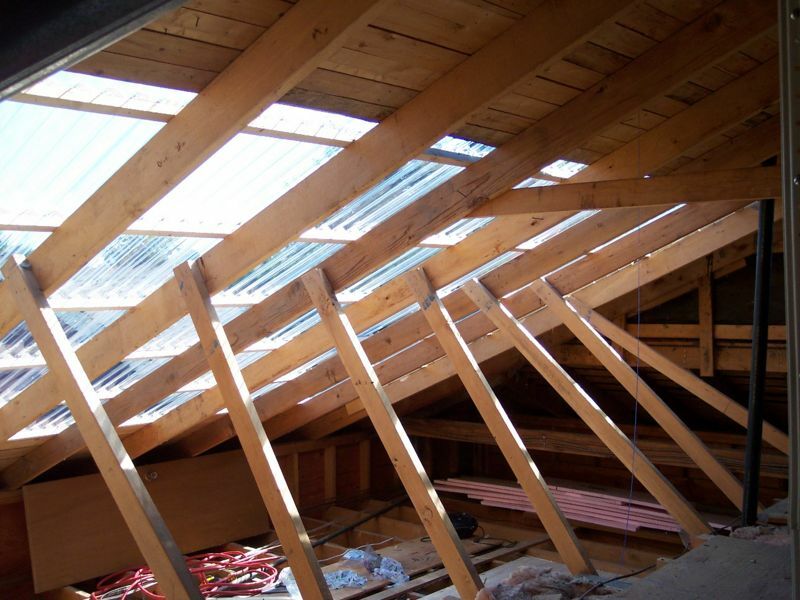 I came across this project when searching for converting attic into greenhouse with potentially using the attic flooring as green roof. I am thinking about getting an old house and use the money saved compared to move-in ready house towards upgrades like this. Thanks for sharing. What do you do in the summer? Seems like the attic would top 200 degrees or more. That is a great question. I just added a detailed update to the end of the article that should help answer it. With ventilation windows closed, the maximum temperature should be more than 30 degrees C above ambient (since I measured 30 degrees C above ambient in February when the sun is low on the horizon). Perhaps it might reach 40 degrees C above ambient in the summer which could be around 70 degrees C (ambient temperature rarely exceeds 30 degrees C here). However, I always open the ventilation windows and attic hatch in the summer to take advantage of the “solar chimney” effect for cooling my home. In this mode, the maximum temperature I’ve measured in the attic is about 55 degrees C.
Have you any thoughts about using cool air fro the crawl space to help cool the house during the summer, I still have a dirt floor in my crawl space, and could bury a pvc duct in this cooler soil and have several ports with filters and a fan to circulate the air in the house. any thoughts on using geothermal cooling during the summer? I came across your site and am amazed with your roof idea and effort. I am very curious to know how this solar roof has been performing so far for you, at 2017 today! Do you have any feedback or suggestions coming from your little experiment with this roof? So what is the climate like at where you are located? Looks like it rarely falls below 0 degree Celsius, or maybe i am wrong. I am in Denmark and also thinking of making something similar to this. it is always great to see a fellow interested person in this type of roof. Thanks and good wishes to you! Thoughts for your leaks and drips at the screw heads. 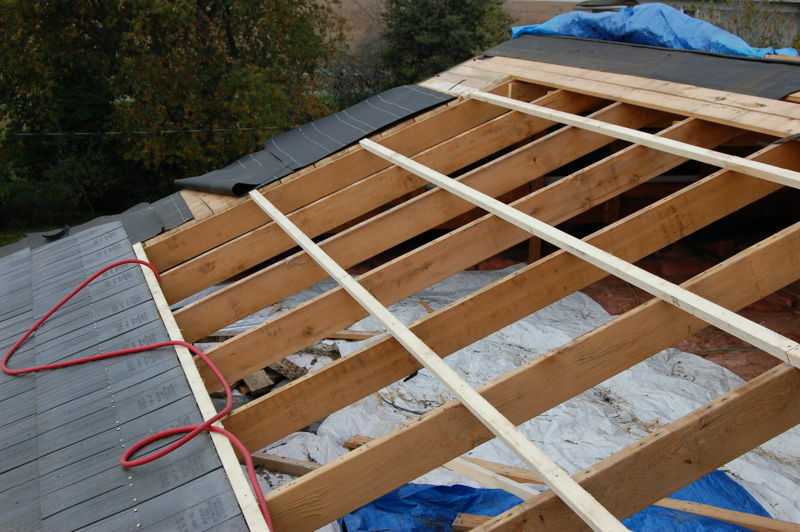 I would put something like DeckWise Joist Tape on the rafter to protect them from the eventual drips and give yourself more time to notice before permanent damage occurs. 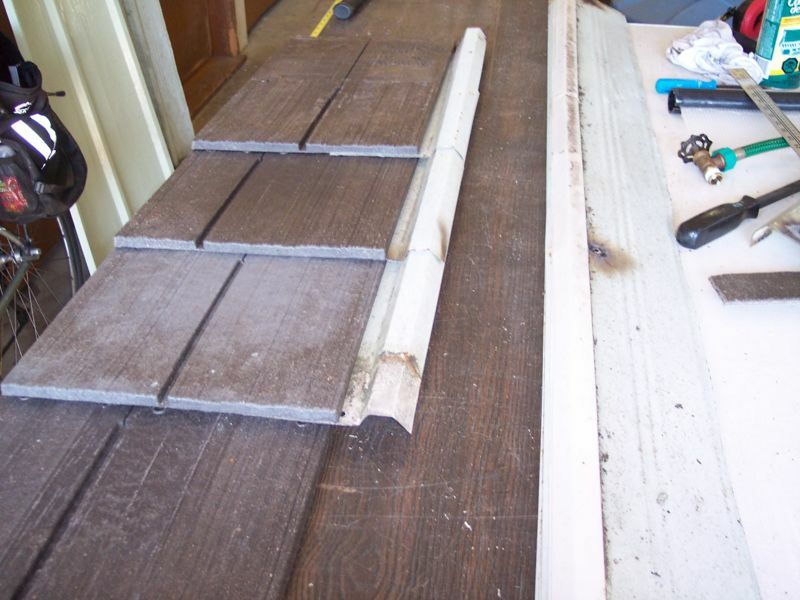 You could use a router or a saw to put a grove in the joist to help the water stay on the tape and run it into a flashing system at the bottom. 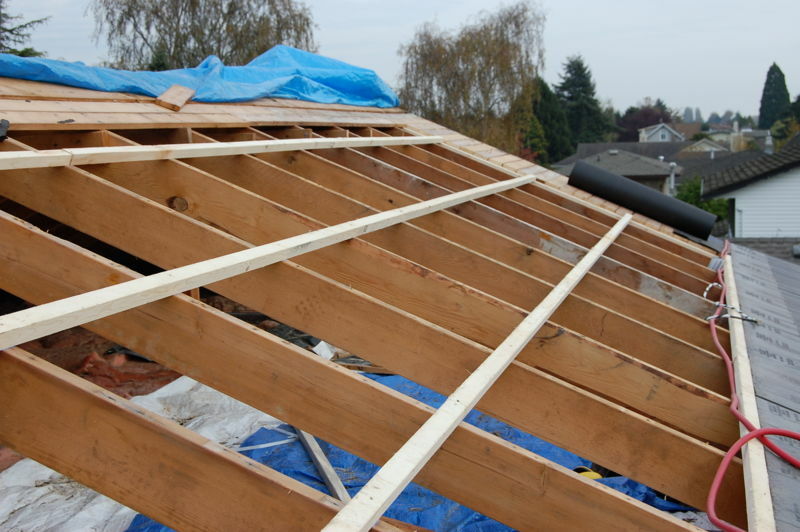 If you ripped strips of the same plastic with two valleys and one hill, they could be siliconed in place over the joist runs. That way the screws wouldn’t receive water. 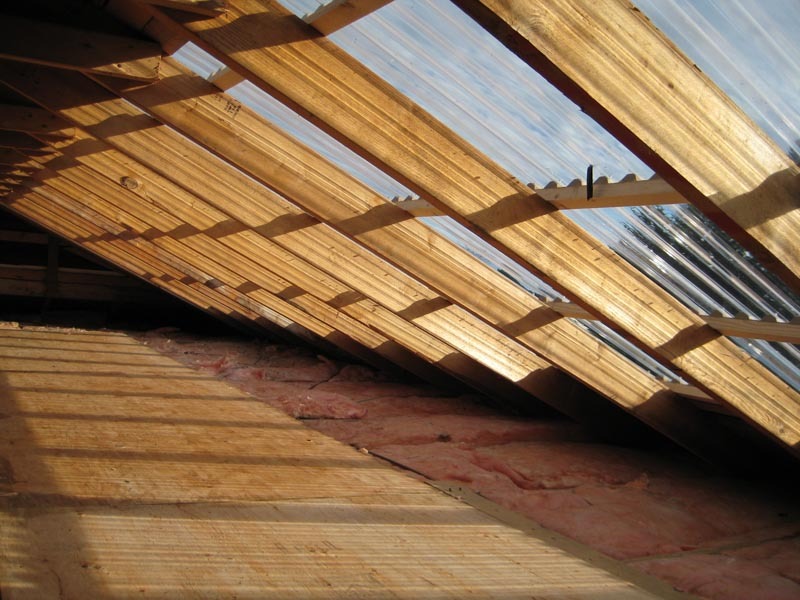 Amazing – I have been looking at ways to do a Skytherm roof which is basically a roof pond/water containers with a movable layer of insulation/radiant barrier. In summer you cover the “pond” with the insulation during the day and uncover it at night so the building dissipates heat. In the winter you do the opposite so you get solar gain. I had come to the conclusion that a clear polycarbonate panel roof would be good to keep the weather out with possibly a roller blind made of silvery bubblewrap as the insulator/radiant barrier, mounted under the rafters. And here you have already built the very roof needed! I think the Skytherm idea is better suited to a single story design and needs good thermal transmittance between living space and attic. Also as you mention you already get cooling from the stack effect.